To get started with astrophotography, all you really need is a camera, a tripod, and a dark spot to shoot. However, taking pictures of the night sky is a lot different than standard photography, so it’s important to adjust your camera settings. You won’t need your camera’s flash or red-eye reduction features, so make sure that they are turned off. For most astrophotography, you will want a high ISO, such as 1600 or 800. If the sky appears too bright, lower the ISO and set the aperture to a larger f-number. 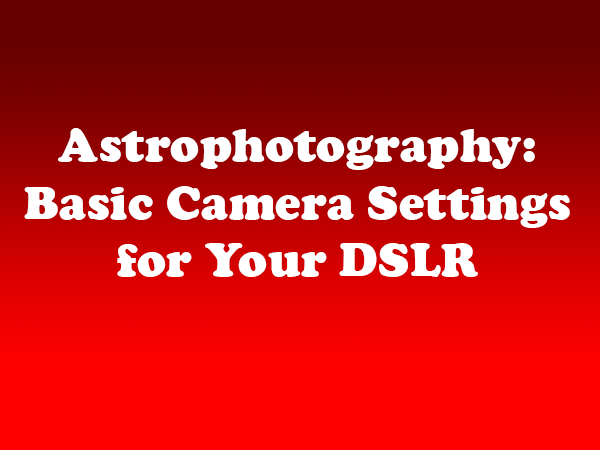 Most DSLR cameras allow you to set the exposure time in increments of seconds up to 30 seconds. For even longer exposures, you will need to use the bulb or ‘B’ setting. A remote control or a shutter release cable is also helpful to avoid shaking the camera when taking the pictures. Otherwise, you can also use the camera’s “timer” feature. Because the earth is constantly spinning, objects in the sky are also moving relative to the earth. To avoid star trails, the rule of thumb is to divide 600 by the focal length of the lens you are using. The result is the amount of time you can leave the shutter open and avoid capturing the star trail. With regard to file format, the RAW setting delivers the best results. Of course, keep in mind that these large files will take up more space on your memory card. When you are ready to start taking pictures, take at least five consecutive pictures before making any adjustments. When you are ready to edit the images later, you can use special editing software stack the shots to create a single, better quality photograph. (We will tackle editing in a subsequent post). To help differentiate between each series of photos, it can be helpful to take a picture of the ground or your hand. For more tips and resources, please check back for additional posts in this series.